Elevator selfie while waiting for rescue! Sunday we held our Commencement ceremony for 205 Bolivar Liberator graduates. It was a great day, and I'm so thankful for all the teamwork that makes an event like this a success. I am truly surrounded by rock stars! 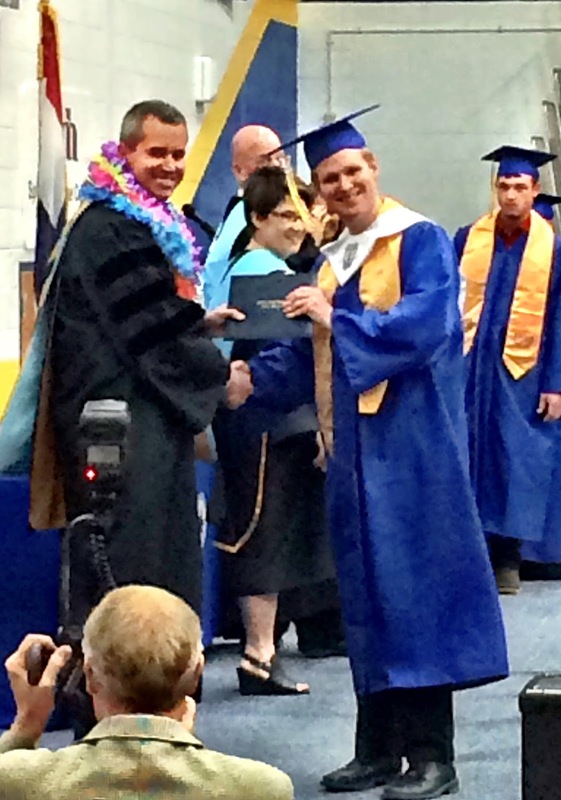 It was an extra special graduation day for me. My son Cooper received his diploma. I had the great honor of presenting it to him. He plans to attend Southwest Baptist University next year to study computer science. I'm a proud dad! 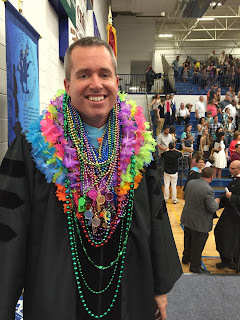 You might notice in the picture I am wearing an abundance of beads and Hawaiian leis. The graduating class usually gets me a little gift that each person hands me as they make their way to receive the diploma. This year I was all decked out. It’s customary for graduation speakers to bestow some parting wisdom on the graduating class. 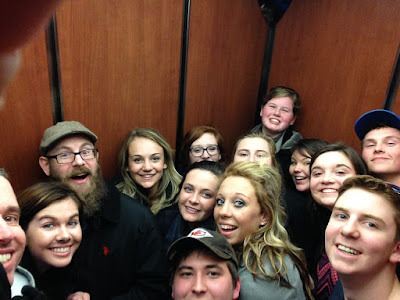 I would like to do that today so I created a short list: 5 Life-Changing Lessons from Being Stuck on an Elevator...in New York City...on Senior Trip. Surround yourself with people who lift you up and inspire you. You don’t want to be stuck on a hot, crowded elevator with negative people. You want people who believe rescue is possible and who can smile and face adversity with a good attitude, people who suggest things like ordering out a pizza or taking a selfie. Work the problem. You start pushing various buttons on the panel, you bang on the door, you use the intercom to call for help. "We’re stuck in the elevator?" Sheepishly, "Really, there's 14 people in here." For the record, I vetoed that idea. Or if you can’t solve the problem, you bring along expert help, like the New York City Fire Department. When you’re on the tenth floor and you’re tired and hungry you might be tempted to try to squeeze into a crowded, creaky elevator. But sometimes the easy way is not the best way. Give that extra effort. Take the stairs. Show a little more patience. Wait for the next elevator. When 12 high school students tell you there’s plenty of room, don’t listen!!! I was recently reading that Jesus’s most repeated command was to not be afraid. It’s mentioned over and over in the New Testament. There is a way to live a life of hope and faith where fear is not in control. We like to try to plan life and have it work out just the way we want. We want things to go as expected. But then you get stuck in an elevator. That can be scary. But you have to adjust and keep believing in your dreams. Many of you have big plans for after high school. Some of you aren’t sure what you want yet. But I hope as a result of your time at BHS, you know yourself a little better, you’re a better problem-solver, and you can adapt to the challenges life throws at you. You may get stuck in an elevator now and then, but you can handle just about anything because you won’t give up. And one bonus piece of advice - very important - use a high quality deodorant. If you’re ever stuck in an elevator, everyone will thank you.